Humans are considered the hosts for spreading epidemics. The speed at which an epidemic spreads is now better understood thanks to a new model accounting for the provincial nature of human mobility, according to a study published in EPJB. The research was conducted by a team lead by Vitaly Belik from the Massachusetts Institute of Technology, USA, who is also affiliated with the Max Planck Institute for Dynamics and Self-Organization, Germany. Chinese scientists have manipulated the charge and the degree of freedom, known as spin, of electrons and their associated magnetic properties in a single-layer carbon material called graphene, making it suitable for applications involving superconductivity, a quantum mechanical phenomenon in which electrons travel in a material with no electrical resistance. These findings have recently been published in an article in EPJB by Chunxu Bai from Anyang Normal University and colleagues from the Henan Institute of Science and Technology in Xinxiang. Vacuum polarisation, the modification of the photon propagator due to virtual electron-positron pairs, is one of the first quantum loop corrections encountered in field theory. In both QED and QCD it causes the running of the appropriate fine structure constant as the physical scale is varied, and also corrects the magnetic moments of electrons and muons from the value 2 predicted by the Dirac equation. A team of scientists have made it easier to study atomic or subatomic-scale properties of the building blocks of matter (which also include protons, neutrons and electrons) known as fermions by slowing down the movement of a large quantity of gaseous atoms at ultra-low temperature. This is according to a study recently published in EPJ D as part of a cold quantum matter special issue, by researchers from the Paris-based École Normale Supérieure and the Non-Linear Institute at Nice Sophia-Antipolis University in France. Scientists have shown the energy conditions, under which a weak signal supplied to a physical system emerges as a stronger signal at the output thanks to the presence of random noise (a process known as stochastic resonance), in a paper that has just been published in EPJB. Gene therapy can only be effective if delivered by a stable complex molecule. 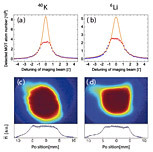 Now, scientists have determined the conditions that would stabilise complex molecular structures that are subject to inherent attractions and repulsions triggered by electric charges at the surfaces of the molecules, in a study published in EPJE, by Valentina Mengarelli and her colleagues from the Solid State Physics Laboratory at the Paris-Sud University in Orsay, France, in collaboration with Paris 7 and Evry Universities scientists. Scientists have shown that it is now possible to simultaneously create highly reproductive three-dimensional silicon oxide nanodots on micrometric scale silicon films in only a few seconds. Xavier Landreau and his colleagues at the University of Limoges, France, demonstrated in their paper published in EPJ D that they were able to create a square array of such nanodots, using regularly spaced nanoindents on the deposition layer, that could ultimately find applications as biosensors for genomics or bio-diagnostics. The effect of microwave heating and cell phone radiation on sample material is no different than a temperature increase, according to scientists from the Department of Chemistry and Biochemistry, Arizona State University, in Tempe, as published in a recent issue of EPJ B. The publishers of The European Physical Journal C – Particles and Fields are pleased to announce the appointment of Professors Gino Isidori (Frascati) and Sergei Odintsov (Barcelona) as new theory Editors-in-Chief. This follows the splitting of the theory section into Theory I: Phenomenology of the Standard Model and Beyond, now led by Gino Isidori, and Theory II: Gravitation, Astroparticle Physics and Cosmology, General Aspects of Quantum Field Theories and Alternatives, now led by Sergei Odintsov. EPJ B - Can metals remember their shape at nanoscale, too? University of Constance physicists Daniel Mutter and Peter Nielaba have visualised changes in shape memory materials down to the nanometric scale in an article published in EPJB. Thank you for accepting the paper. Thanks also to the Associate Editor and the referee for their speedy and helpful comments during the review process. I will definitely keep EPJC in mind for future contributions.